Bathing pups can be a mess sometimes, but unfortunately it is an inevitable thing that all pup parents must deal with. If your pups aren’t actively getting themselves dirty by rolling about in dirt and such, they will eventually get stinky and have to be washed anyway! Lucy the Beagle had just undergone a bath. Unfortunately, she was very reluctant about the whole thing, and has decided to sulk in a corner while lying on top of some towels! It is only when Dad offers to make up for it by giving her a biscuit does she seem to forgive him for this horrible transgression. Giving her a treat after a bath is probably a good idea, though! It would help Lucy associate bathtimes with good things, and then bathing would be less stressful for her! Then, bathtimes would become fun for the both of them, and it can become another parent-pup bonding experience! 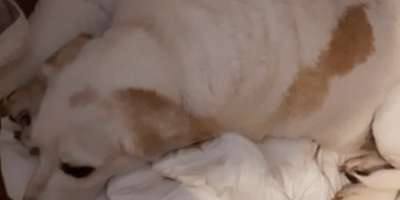 Adorable Pup Meets Twin And Immediately Convinces Mom To Bring Him Home!